Naturally sweet green juice recipe with apple, spinach, parsley, and lemon plus soothing ginger and cucumber. High in iron, vitamin C and essential minerals! 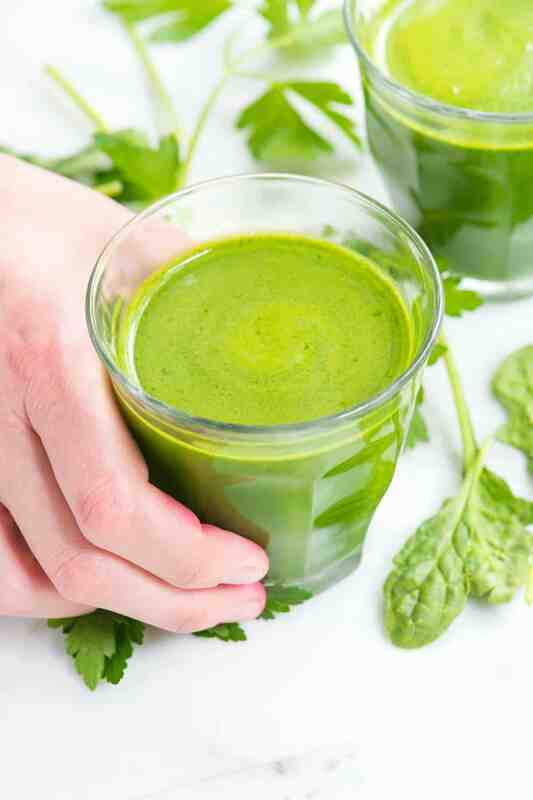 Jump to the Green Detox Juice Recipe or read on to see our tips for making it. We have fallen in love with making vegetable juices at home and have already shared how we make one of our favorite juices with beets, lemon and ginger. Think of juicing as a quick way to get lots of vitamins and nutrients into your body. We don’t do juice cleanses and don’t use juices as a meal replacement. Instead, we love making a small veggie-packed juice and enjoying it with our (usually fiber rich) breakfast or lunch. We stick to mostly veggies when juicing since adding lots of fruit makes the sugar content skyrocket. So far, our favorite veggies to juice are beets and carrots — they are already naturally sweet and really don’t need much help from fruit to make the juice taste incredible. 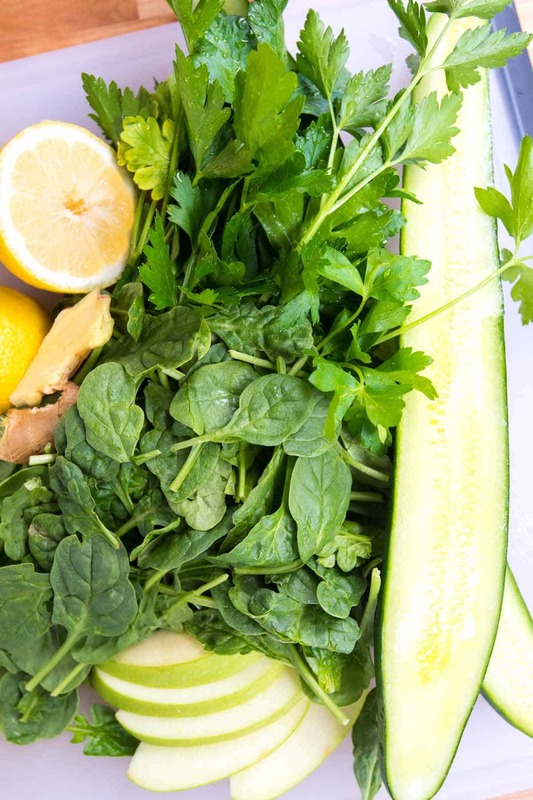 For this easy green juice recipe, we combine highly alkalizing spinach with green apple, cucumber, parsley, ginger, and lemon. Spinach tastes mild and is packed with nutrition, lemon and ginger adds zing, the cucumber adds mineral-rich water, and the apple balances everything out with a little sweetness. We use an Omega juicer and absolutely love it. The majority of juicers on the market break down into two camps — slow juicers/cold pressed (also called macerating) and centrifugal juicers. Basically, this just means that the cold pressed variety slowly presses down the fruits or vegetables until the juice is completely pressed out and the now dry fibrous pulp falls into another container. A centrifugal juicer extracts juice by quickly spinning broken down veggies or fruits around until the juice separates from the pulp. Centrifugal juicers are typically cheaper. There is some debate about whether or not the spinning mechanism creates heat, which can possibly break down enzymes. More importantly to us, centrifugal juicers are not as efficient at getting as much juice out of the produce, which means produce costs might go up. When it comes to juicing greens, the Omega juicer flies through them. You can sometimes get away without a juicer when making juices at home — we share how to make our beet juice using a blender. For greens, it really is best to use a high quality juicer — a blender just won’t cut it. A juicer makes quick work of the greens as well as everything else. The juice comes together in under 10 minutes. 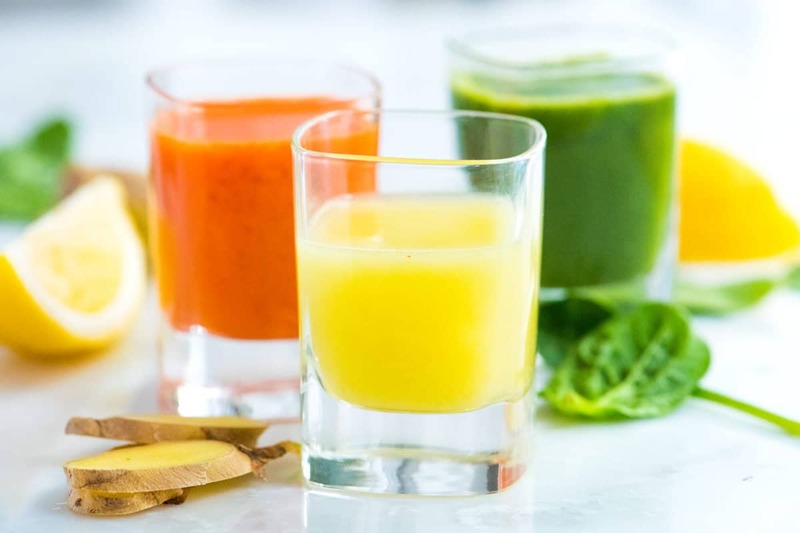 YOU MAY ALSO LIKE: Three immunity boosting ginger shot recipes perfect for busy mornings or a quick boost. See how to make lemon ginger, carrot ginger, and green apple ginger shots. Jump to the Ginger Shot Recipes. I love learning about all the goodness in veggies so let’s geek out a little together, okay? Green Apple is our go-to sweetener for green juices. It’s cheap and does a good job of balancing out any bitterness or earthiness of the greens. When juiced with the peel still on, apples are a great source of vitamin A, vitamin C, and potassium. Apples help with breaking down toxins, lowering cholesterol, and helps with digestion. Add apples with the peel left on, but do not juice the core. Apple seeds may not be the best for us. Parsley is an antioxidant powerhouse and is rich in vitamins and minerals such as potassium, iron, magnesium, vitamin A, vitamin B, vitamin C, vitamin E, and vitamin K. The flavor of juiced parsley is strong, but just a handful of the stems and leaves will leave the juice with a bright green color and fresh taste. It’s nicely balanced with the lemon, cucumber, and apple. Spinach is rich in iron (almost twice as much as other greens). Since spinach is easily available and inexpensive, it’s our go-to green for juicing. 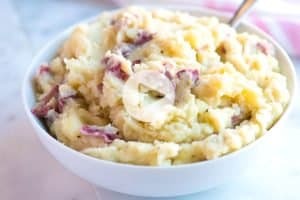 The taste is very mild and it pairs nicely with other vegetables and fruits. Spinach is alkalizing and is rich in many essential vitamins and minerals. A real powerhouse! Cucumber is high in vitamin A, B complex, vitamin C and folic acid. It’s aids in cell hydration, regulating body temperature and eases inflammation. It’s high silica content also helps to alleviate skin problems, hair loss and strengthens nails. We love adding cucumber to our juices — it tastes mild and adds lots of mineral-rich water. There’s also lots of research looking into cucumbers’ anti-cancer properties. We prefer to use the thinner skinned varieties of cucumbers — hot house or English cucumbers are perfect. Lemons are high in immune boosting vitamin C and help out with potassium and vitamin B6. They are highly alkalizing and are widely known for their detoxifying and antioxidant properties (hello pretty skin). Oh and if you are like me (a little anemic), all that vitamin C helps out with absorbing some of the iron found in the greens. Ginger is a powerhouse in juices. Thanks to gingerols, ginger has powerful anti-inflammatory effects, aids in digestion and relieves bloating. There is no need to peel ginger before adding to the juice. Scrub it clean, cut a piece off then push it through your juicer. If you’re sensitive to ginger’s warming/spicy quality, add a smaller amount at first and go from there. 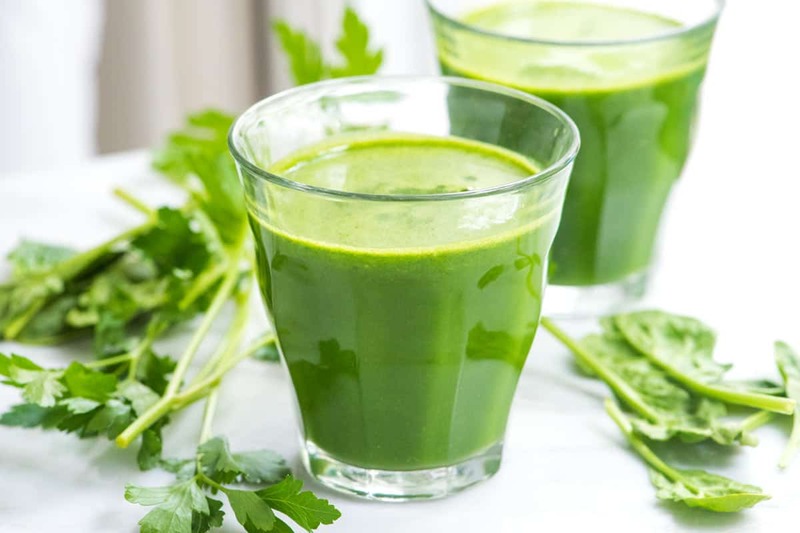 In this juice, spinach tastes mild and the parsley tastes fresh. Lemon and ginger add zing, and the cucumber adds mineral-rich water. Apples are naturally sweet so we don’t add any additional sugar or fruit, with the exception of a lemon. If you find the juice too tart, consider pushing a couple carrots or an extra apple through the juicer. If you’re sensitive to ginger’s warming/spicy quality, add a smaller amount at first and go from there. Chop the apple, cucumber and ginger into thin pieces small enough to easily go through the juicer. Reserve about half of the lemon. Turn the juicer on and push everything through, alternating between the greens and the firmer cucumber, apple and lemon. When everything but the reserved lemon has been juiced, stir the juice and taste for tartness. Add the remaining lemon if you feel it can take it. Or if the juice is too tart, consider adding a couple scrubbed unpeeled carrots or another cored apple. Make-ahead: Fresh vegetable juice is best enjoyed soon after juicing, but you can make it a day or two in advance. Store in glass, airtight containers. If you have used a cold pressed juicer, it should last a little longer. Hello, i am going to have a new a juice recipe from here, it is so nice. 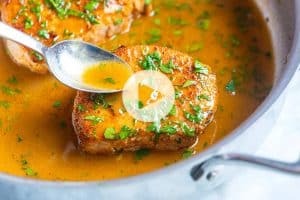 this sounds very good and I would like to receive the recipes! Can I use my bullet to make your hummus recipe? Hi Janet, We have never made the hummus in a bullet blender, but a few of our readers have had success with it. I found that juicing is a healthy source of energy and Absolutely a special way to detoxify the blood! 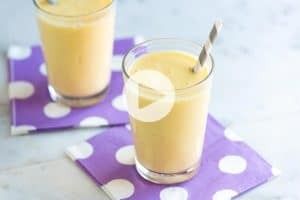 Thank you for these fabulous and delicious juice recipes! Hi Sandra, There will be fiber left in the juice — specifically this will be soluble fiber. 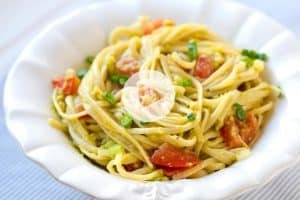 The other fiber found in foods is insoluble fiber. This is what is left in the pulp. It is hard for us to say how much fiber (in grams) will be in each juice since I have not found an appropriate source to calculate soluble vs. insoluble. Just a question: is adding apple a good idea when the purpose of taking a green vegetable juice is for a bowel/colon cleanse? While it clearly has nutritional value, in this context, when the intention is to cleanse with weight loss in mind would adding apple, a fruit containing fructose be a good idea? If a juice has too much natural sugar it can affect insulin levels pretty dramatically, causing cravings which can then obviously make it harder to stick with it. Your feedback would be much appreciated. Hi Alex, You can absolutely leave the apple out or use half as much as we suggest in the recipe. The apple balances out the flavors, but the juice is still really tasty without it. When we do use apple, we go for green apples since they are not as sweet.